SACRAMENTO–Today, Sacramento District Attorney Anne Marie Schubert announced that her office will not press charges against the officers who shot and killed Stephon Clark in his grandmother’s backyard on March 18, 2018. Clark was unarmed, holding a cell phone, at the time he was killed. Today’s decision opens a new wound for the Sacramento community and serves as a potent reminder that California’s law on the use of deadly force needs immediate reform. Our hearts go out to Mr. Clark’s friends and family, and the entire Sacramento community. No family should have to live through what Mr. Clark’s family is going through: first traumatized by a system of policing that violently and unjustly takes the lives of unarmed Black men at alarming rates and retraumatized again by a justice system that is set up to sanction these unnecessary killings. Sadly, they are not alone. Instead, they join hundreds of other California families who have been robbed of their loved ones and seen no justice. As a society, we give police officers the most significant power we confer on the government — the power to take someone’s life. Our laws must set appropriate standards to ensure police officers use that power sparingly and with the goal of preserving human life. Of equal importance is the requirement that officers be held accountable when they violate these standards. 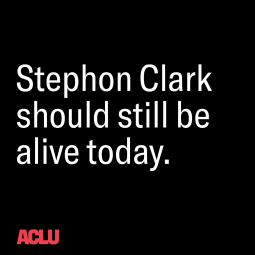 We stand with the Clark family in calling on California legislators to act now to prevent more of these deadly tragedies – and subsequent miscarriages of justice – from happening. AB 392 offers a clear path forward. The bill updates California’s use of force law to ensure police officers use deadly force only when necessary to prevent serious harm. It also mandates that officers use de-escalation tactics whenever possible. Inaction is not an option. Establishing clearer use of force guidelines under AB 392 is a matter of life or death." We are deeply grateful and inspired by your support. Together with you, the ACLU will vigilantly protect our rights every day of the Trump administration as we have through every presidential administration for the last 99 years. 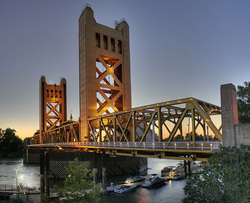 The Sacramento Area Chapter of the ACLU is a group of community activists dedicated to preserving civil liberties and advancing social justice. eOur work can be divided into three functions: community education and visibility, local monitoring and advocacy, and participation in state and federal campaigns. Educating the community is our top priority – we believe the best way to protect our rights is to know them. We speak at schools, host community forums, and lead know-your-rights workshops. We also attend City Council and Board of Supervisors meetings to ensure our elected officials make decisions that respect the needs of Sacramento's diverse communities. Finally, we support the active program of the ACLU of Northern California and organize community members around important state and federal campaigns for justice. One Year Later! Take These Streets For Stephon Clark! Stay connected - we're in social media! See what other activists in Sacramento County are talking about and get engaged in the conversation by visiting our ﻿Facebook ﻿Page. Visit our ﻿Youtube ﻿page for local civil liberties videos. And be sure to follow the ACLU of Northern California's ﻿﻿Twitter ﻿﻿page.